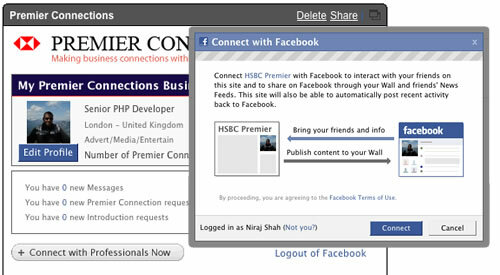 The HSBC Premier iGoogle Gadget was built using Facebook Connect to link to the complete application within Facebook. The facebook application was intended to be a professional network of friends within Facebook’s platform, similar to LinkedIn. Users could ask for introductions to other users, add their professional skills and connect to other professionals. The iGoogle Gadget for HSBC Premier was the first implementation of Facebook Connect within iGoogle. The Facebook Connect functionality was only a few weeks old when I worked on integrating it into the application. Unfortunately, the application never went live. Of course this happens with some other applications I worked on, for example another Facebook applications, an online casino site (www.casino.com), and a microsites. Although the sites and applications never went live, I did gain experience in using new technologies.